It has been a good five to six years since psychedelic/blues rock band Parvaaz propped up their own ladder and started climbing up in their reputation as one of the most formidable, unmissable live performers. Of course, this energy has been somewhat transformed equally well in their recorded releases such as Behosh (2012) and Baran (2014), but now there’s their latest live DVD album, Transitions, which aims to capture the four-member band at their trippiest best. The approximately 90-minute film, captured by Bengaluru filmmaker Gokul Chakravarthy and his team, was born out of Parvaaz’s one night only auditorium show at Jagriti Theatre in July last year. While there are a few collaborators whom Parvaaz have a special place for – from vocalist Alexis D’Souza to keyboardist Rauf Abdul (from the Ministry of Blues) and Swarathma violinist Sanjeev Nayak – Transitions is solely dedicated to showcase the band’s sonic evolution from the early Led Zeppelin-inspired jams such as “Dil Khush” to the roaringly prog-leaning set staples such as “Baran” and “Gul Gulshan”. The DVD also includes newer material such as “Colour White” and “Shaad” that leans towards steady build-ups and acoustic guitars. Although there’s not much that Chakravarthy concentrates on outside the performances, a few bits of interviews with Nayak and Abdul seem like little. They do add a new hue to breakaway from becoming just song after song being presented. Aesthetically, the lights don’t stray away to anything too vibrant, but the monochrome mixed with smoke and shadows nearly reflects how well the band’s music also plays with space and silence in their epic-length songs. That’s why songs such as “Baran”, which Ahamed introduces with its prelude “Roz Roz” as “The Long Song”, are captured at their haunting, goosebumps-inducing best. Although the band performs “Ziyankar” minus their original collaborator – saxophonist Seth Molloy – they invite Abdul to work his magic on the keyboards, adding glistening synth and a smoky organ section, which indicates nearly all of Parvaaz’s songs can be in a transitionary space as well. 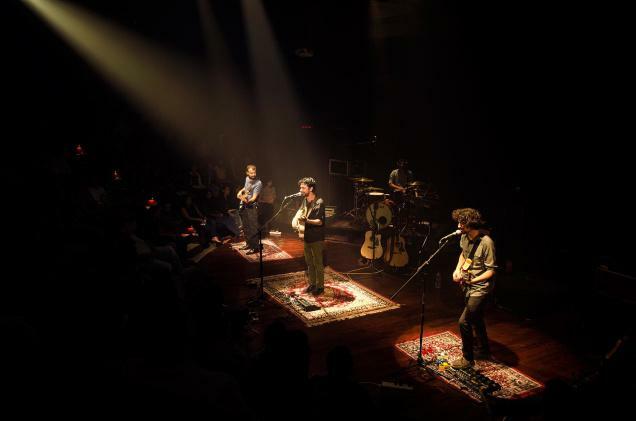 They have shows set in Muscat and Dubai, their first ever international shows, but Parvaaz still has a lot of ground to cover across India. If Transitions reaches the right number of people, the demand will be even higher.